This book is the first of its kind to collectively address design-based and mechanical micro-manufacturing topics in one place. It focuses on design and materials selection, as well as the manufacturing of micro-products using mechanical-based micro-manufacturing process technologies. After addressing the fundamentals and non-metallic-based micro-manufacturing processes in the semiconductor industry, it goes on to address specific metallic-based micro-manufacturing processes, such as: micro-forming, micro-machining, micro-molding, micro-laser processing, micro-layered manufacturing, micro-joining, micro-assembly and materials handling, and microEDM and ECM. 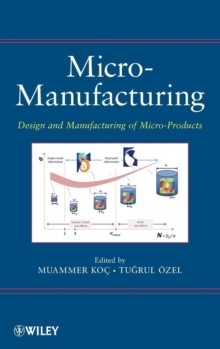 The book provides an in-depth understanding of materials behavior at micro-scales and under different micro-scale processing conditions, while also including a wide variety of emerging micro-scale manufacturing issues and examples.